"Diagnostic Controversy provides a diverse and intriguing window into the 'diagnostic moment,' when clinicians provide and patients learn what disease they have. In the vein of Latour and Woolgar’s Laboratory Life, the authors provide an anthropology of knowledge about how diagnoses are constructed and how what is often presented as a medico-technical enterprise is suffused with cultural, social, political and economic influences. The broad set of case studies in this book, edited by Carolyn Smith-Morris, provide rich examples from a range of disease categories, not only psychiatric diagnoses that have been a major critical focus of medical anthropologists. The book interrogates a central question in medical anthropology about the boundaries between the normal and the abnormal, introduced to the field by Ruth Benedict in 1934. The book provides new directions in 'critical studies of biomedical praxis' that both informs the field in new ways about the process of diagnosis and provides a framework for on-going interrogation of medical diagnosis as a highly social and cultural practice, even as medical science further emphasizes the biological and genetic bases of disease." "This groundbreaking book challenges the assumption central to global health efforts that prioritizes standardization of diagnoses, to impose uniformity and promote regulation across geographical and social boundaries. 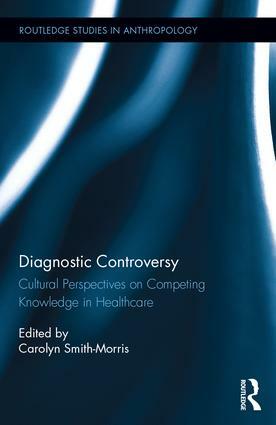 The authors explore the production and negotiation of diagnoses, and argue powerfully that diagnoses are not objective entities but rather are constituted and renegotiated by processes that are not value-neutral. Rich case studies demonstrate strategies of knowing, the emergence of new diagnoses in particular social contexts, and the personal, professional, epidemiological and financial interests that generate diagnostic controversies and contested power relations. This volume is compelling in its argument that diagnosis is less authoritative than uncertain, subject to resistance as well as accommodation. This is the most innovative work on diagnosis as a construct and its implications for healing praxis since the early 1980s and one that is destined to become a classic in medical anthropology." Carolyn Smith-Morrisis a medical anthropologist and Associate Professor at Southern Methodist University.